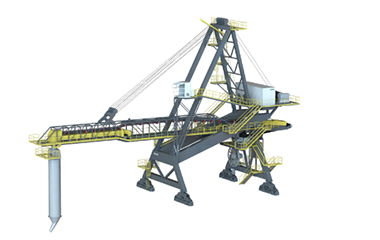 HL500 Shiploader is designed for bulk material loading on a multipurpose quay. HL500 Shiploader travels on linear rails and can be moved to a parking position when not in use. 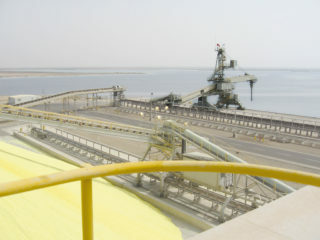 The shiploading capacity ranges from 250 to 2000 tonnes per hour. The ship dead weight tonnage ranges from 15000 to 60000. HL500 Shiploader is designed according to F.E.M. Section II. HL500 Shiploader is equipped with electrical and mechanical safety devices to protect operators and structures. The operator will be able to control the shiploader via HMI located in the operating cabin. HL500 Shiploader has on board MCC and PLC. Optionally HL500 Shiploader can be equipped with different type of discharge chutes, automatic lubrication system, dust suppression or collection, lighting systems, anemometer system, hydraulic end stoppers, CCTV system and standard ATEX classification. HL500 Shiploader can be supplied partly assembled or fully assembled and cold comissioned.